New Sony Endpoint? What Would Be The Point? August 23, 2013 | David S. Maldow, Esq. An item crossed my desk today regarding a new Sony endpoint. While the article appears to be referring to an existing product, it did get me thinking about Sony and videoconferencing. I have always been confused by Sony's position in the videoconferencing market. This particular product, the $8,999 PCS-XG100S (shown above, and released earlier this year) is a perfect example of my concern. Why is Sony, one of the best video electronics manufacturers on the planet, always behind the times and off the mark when it comes to videoconferencing? With Sony's amazing video expertise and massive resources they should be able to offer more than products which simply play industry catch up, and lean on "specmanship" over user experience. The device does match up decently against the competition on traditional specs with 1080p60 support and a 9 point embedded MCU. But these aren't "Sony Only" features or significant differentiators. In some areas it appears to be well behind the times, such as its support of H.264 HP rather than H.264 SVC. Bottom line, the product has strong features in general, but nothing particularly leading, as you can see in the video below. The video annotation feature looks interesting, but again, not a Sony only, and not a game changer. Recording to a thumb drive is certainly cool, and a few years ago I would have said it was a nice differentiator, but today I can record my video calls in the cloud. Where is the Sony ingenuity and leadership? If Sony wants to turn its eye towards videoconferencing, they should make something great. They should transform the industry the way they transformed the gaming industry with their amazing PlayStation line of products. Sony understands user experience, so why do they not apply this knowledge to their videoconferencing products. This is not a new issue for Sony, their VC line has always appeared to be designed around specsmanship, rather than usability. Several years ago I tested Sony's first 1080p VC codec, a predecessor to this model. Its spec sheet looked good, matching the capabilities of the market leaders, but in reality it was more of a technology demo than an actual product. For example, it could provide 1080p if you rebooted it in "1080p mode" which disabled most of the other functionality of the device in order to provide enough processing power for 1080p video. No one in the field would use it that way, and that is but one example of my concerns with that particular device. I assume they resolved many of the issues from that earlier model with this 2013 release, but they still appear to be designing these appliances around spec requirements, without putting any design resources into usability and workflow. 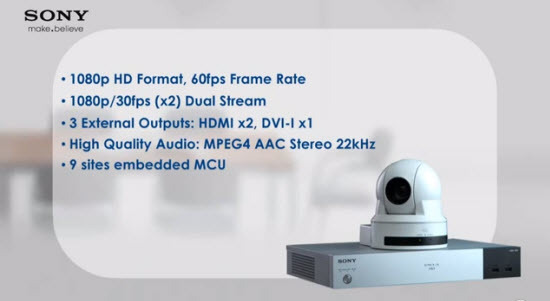 I would really like to understand Sony's ultimate vision for videoconferencing.�Will they always be satisfied to simply clip a few sales in markets where their channel is strong enough to push these boxes over the industry leading models. Sony should have made a consumer videoconferencing endpoint 3 years ago. They certainly understand consumer electronic design, they have a great channel to reach the consumer marketplace, and were better positioned than anyone to come out with an affordable living room based appliance. Instead they were satisfied to offer business class video solutions that lag behind the competition, and now the window for a living room appliance may have passed due to the proliferation of desktop and tablet-based videoconferencing. Is it too late for Sony to wake up and do something great for consumer videoconferencing? An item crossed my desk today regarding a new Sony endpoint. While the article appears to be referring to an existing product, it did get me thinking about Sony and videoconferencing. I have always been confused by Sony's position in the videoconferencing market. This particular product, the \$8,999 PCS-XG100S (shown above, and released earlier this year) is a perfect example of my concern. Why is Sony, one of the best video electronics manufacturers on the planet, always behind the times and off the mark when it comes to videoconferencing? With Sony's amazing video expertise and massive resources they should be able to offer more than products which simply play industry catch up, and lean on \"specmanship\" over user experience. The device does match up decently against the competition on traditional specs with 1080p60 support and a 9 point embedded MCU. But these aren't \"Sony Only\" features or significant differentiators. In some areas it appears to be well behind the times, such as its support of H.264 HP rather than H.264 SVC. Bottom line, the product has strong features in general, but nothing particularly leading, as you can see in the video below. This is not a new issue for Sony, their VC line has always appeared to be designed around specsmanship, rather than usability. Several years ago I tested Sony's first 1080p VC codec, a predecessor to this model. Its spec sheet looked good, matching the capabilities of the market leaders, but in reality it was more of a technology demo than an actual product. For example, it could provide 1080p if you rebooted it in \"1080p mode\" which disabled most of the other functionality of the device in order to provide enough processing power for 1080p video. No one in the field would use it that way, and that is but one example of my concerns with that particular device.